We are expecting people to cancel if they win the DND parking lottery. Join the waiting list and I will get back to you as soon as more spots open up. This agreement is for the extended use of the Villa Lucia outdoor parking lot for non-patrons. There is no fee for Villa Lucia patrons during our regular business hours. Tthe applicant agrees to be bound by the terms and conditions and to respect the rules set forth below. The cost of the monthly parking permits is $75.00 CAD which is due on the first of the month. Villa Lucia reserves the right to modify this monthly rate at the beginning of any time. The permit allows the applicant to park only one vehicle in the outdoor parking area at any given time, during the term of the agreement. 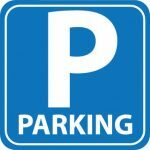 Parking privileges are not transferable and cannot be rented, sold, or loaned and only a vehicle used by the permit holder may park in the indoor parking area. Vehicles may be left overnight in the event the vehicle is disabled. Please e-mail lucia@villalucia.com to let us know if your car will remain overnight. The permit can be cancelled by Villa Lucia at any time, without prior notice. No mechanical work is to be done in the parking lot at any time. (Including changing tires). All vehicles must display the appropriate parking permit as provided by Villa Lucia. The parking permit must be returned to Villa Lucia at the end of the agreement term. Villa Lucia has the right to ask the applicant to temporary remove his/her vehicle at any time. If they fail to remove or relocate the vehicle after being advised to do so, the vehicle may be towed without further warning, at the applicant’s expense. Each vehicle must be parked between two painted lines and not in the lane way of the parking lot. Use of the parking space is at the applicant’s own risk and Villa Lucia shall have no liability whatsoever for any loss of, or damage to, the vehicle or its contents, or for any personal or bodily injury suffered by any persons in the parking area, whatever the cause. Villa Lucia will not be responsible for problems with the access to, or the use of the outdoor parking lot if it is affected by snow, water, etc. Villa Lucia may revise this agreement at any time, and the applicant will accept and follow all new contract regulations when added to the current contract. Parking for partial months must be paid in full. Only the first month may be pro-rated. Larger vehicles such as pick-up trucks, buses, and commercial vehicles may require an addition fee. We may allow permitted cars to be parked for extended periods of time. Permission must be sought ahead of time. The right to use the parking area is also subject to the terms of the Parking Guidelines attached hereto, as may be amended by Villa Lucia from time to time. If any of the above rules are not adhered to, Villa Lucia has the right to revoke the parking privileges, with immediate effect. All questions should be submitted in writing via e-mail to ‘lucia@villalucia.com’. You must agree to these rules in order to obtain a permit.